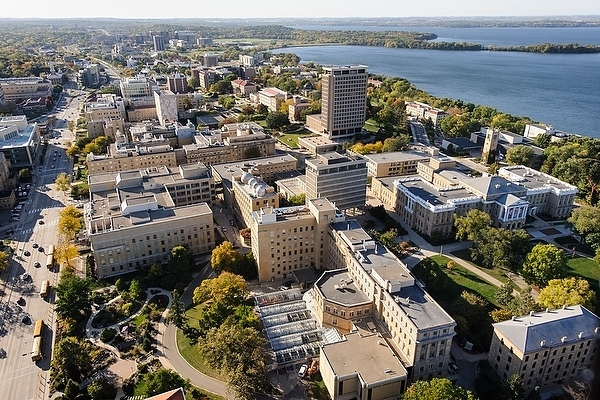 The University of Wisconsin–Madison, whose campus is pictured, is 10th among public institutions in U.S. News & World Report‘s latest college rankings. The methodology used to produce the rankings is almost identical to last year’s, with a slight change in how the class size portion of the ranking is calculated. Criteria used include retention/graduation rates, academic reputation, financial resources, faculty resources and student selectivity. The report also evaluated undergraduate engineering and business programs. For the third year in a row, the College of Engineering ranks 14th overall, and for the fourth year in a row, it ranks seventh among public doctoral institutions. The undergraduate program at the Wisconsin School of Business is ranked 19th overall in a four-way tie and is ninth among public doctoral institutions. The insurance/risk management program is ranked fifth overall and third among public universities, while the real estate program is ranked first among public institutions for the fourth year in a row, and second overall for the third year in a row.